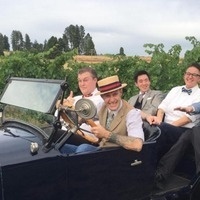 Crescent Katz bring their high energy brass band jazz (complete with washboard and stand-up bass) to the outdoor stage at the Commons Farm Kitchen/Rustic BBQ on April 20th, from 5-7 PM. Join us for our every Saturday wood fired BBQ and hang out and dance to some awesome music. Dogs and children welcome. We are open from 12 noon to 9 pm on Saturdays. Also join us for brunch on Sundays from 10-3 and our regular hours are Wednesday through Saturday 12 pm to 9 pm. Take CA-16 past Cache Creek Casino to Guinda. Restaurant is on the left hand side.